Looking for the Cole Protocol, a military law of the UNSC? 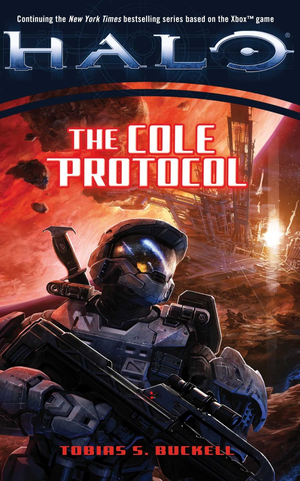 Halo: The Cole Protocol is the sixth novel based on the Halo universe. It is written by Tobias S. Buckell and was released on November 25, 2008. “ In the first, desperate days of the Human-Covenant War, the UNSC has enacted the Cole Protocol to safeguard Earth and its Inner Colonies from discovery by a merciless alien foe. Many are called upon to rid the universe of lingering navigation data that would reveal the location of Earth. Among them is Navy Lieutenant Jacob Keyes. Thrust back into action after being sidelined, Keyes is saddled with a top secret mission by ONI. One that will take him deep behind enemy lines, to a corner of the universe where nothing is as it seems. Out beyond the Outer Colonies lies the planet Hesiod, a gas giant surrounded by a vast asteroid belt. As the Covenant continues to glass the human occupied planets near Hesiod, many of the survivors, helped by a stronghold of human Insurrectionists, are fleeing to the asteroid belt for refuge. They have transformed the tumbling satellites into a tenuous, yet ingenious, settlement known as the Rubble--and have come face-to-face with a Covenant settlement of Kig-Yar . . . yet somehow survived. News of this unlikely treaty has spread to the warring sides. Luckily for the UNSC, this uneasy alliance is in the path of the Spartan Gray Team, a three-man renegade squad whose simple task is to wreak havoc from behind enemy lines in any way they see fit. But the Prophets have also sent their best---an ambitious and ruthless Elite, whose quest for nobility and rank is matched only by his brutality... and who will do anything to secure his Ascendancy and walk the Path. The book opens with an attack by Kig-Yar in the Rubble, an Insurrectionist asteroid base which was constructed as a refugee base during the Covenant siege of Madrigal. The Jackals are attempting to steal navigation data from Ignatio Delgado and his friend Melko Hollister. The Jackals want the data because it would lead the Covenant to humanity's homeworld, Earth. Melko manages to escape the fighting at Delgado's insistence that the last remaining navigation data leading to Earth must be kept safe. Unfortunately, Melko is shot and later dies of his wounds. While holding off the Jackals, Delgado is almost killed, but is saved by SPARTAN Adriana-111 of Gray Team. She hands him a beacon, which will send a signal to her team to retrieve the data if he should no longer be capable of keeping it safe. She then orders him to keep Gray Team a secret from the Rubble Security Council. Meanwhile, at the colony of Chi Rho, Lieutenant Jacob Keyes meets with Commander Dmitri Zheng and is transferred from teaching at the Luna OCS Academy to enforce the newly written Cole Protocol with the stealth frigate, the UNSC Midsummer Night. He returns to his ship with a new pilot, Jeffries, an ONI officer Major Watanabe and Zheng in command. Back at the Rubble, Delgado looks for clues, suspecting that someone within the Rubble Security Council is attempting to sell the navigation to the Jackals, which would cause the Insurrectionists to outlive their usefulness to the Covenant. Delgado learns of the Kestrel, a ship under the command of Peter Bonifacio, a known smuggler who is also on the Security Council. While trying to obtain information about the Kestrel, he meets Adriana again in a small bar, Eddie's In The Rock. They are both attacked by Insurrectionists, who overhear the questioning. After being saved again by Adriana, he is taken to the SPARTANs' ship, the Petya, to meet Jai-006 and Mike-120. Jai explains that Gray Team has been working to destroy any navigation data as per the Cole Protocol, and that they are causing general havoc against the Insurrectionists. As Delgado leaves, he is instructed to find out more about the Security Council leak. Back on the Midsummer Night, Jacob Keyes attempts to enforce the Cole Protocol on a civilian freighter. When the Lieutenant and a group of Orbital Drop Shock Troopers board the freighter, the Insurrectionist captain detonates a bomb in a container, killing a number of ODSTs, including their commander, First Lieutenant Canfield. Later, Keyes and the ODSTs are forced to leave the ship by exiting through a hull breach they created because the freighter was rigged to blow the moment the Midsummer Night was within the blast proximity of the freighter. Keyes leaves first, taking the armor of an ODST and jumping into space, using his rifle to maneuver applying Newton's 3rd law. Keyes is able to contact the Midsummer Night. However, the Insurrectionists on the civilian freighter detonate the ship to kill as many of the escaping ODSTs as possible. Keyes is eventually recovered along with most of the ODSTs, including 2nd Lieutenant Faison, despite the dramatic explosion. On Sanghelios, the recently-appointed Sangheili kaidon of clan Vadam, Thel 'Vadamee lies in wait for the inevitable attack by someone with doubts as to his capability as kaidon. He soon gets what he is waiting for as three assassins attempt to dispatch him; however, he quickly slays all three of the assassins. He then orders an assembly with all of his clan's elders. He first shows the elders that the attack clearly failed as he had no scratch on his body. He then explains that he killed the first two assassins with relative ease, but lies and claims that he let the third assassin live in order to learn who sent the attack. He almost immediately noticed the stirring of one of the elders, Koida 'Vadam. Knowing the person responsible he calms down and explains his supremacy to all the elders. He then confronts Koida who foolishly tells Thel that he has sent the assassins. Thel then kills him and banishes his lineage from the Vadam keep. Thel then tells the elders that he is to be sent to a human colony, Charybdis IX, by the Hierarchs. The Midsummer Night arrives at Charybdis in order to prevent a group of Insurrectionists from gaining a shipment of plasma rifles and plasma pistols. Lieutenant Keyes and Major Watanabe go planetside to meet with an ONI group in order to complete their mission. However, the mission goes bad as the UNSC group gets attacked by Insurrectionists and rioters. Major Watanabe is killed, and Keyes barely escapes the planet. As they escape the system, a Covenant fleet led by the High Prophet of Regret eliminates the three destroyers defending the planet and starts to glass the surface. Meanwhile, the future Arbiter is called to meet with the High Prophet of Regret, who was traveling with the fleet to witness the burning of another human world. Regret shows 'Vadamee a modified plasma rifle and says that such modifications of Covenant weaponry by any other than the Prophets is heresy. He orders 'Vadamee to track down the weapons, which he believes originated in the 23 Librae system from Jackals that may be trading with humans. He also tells 'Vadamee that the Jackal ship A Psalm Every Day, along with a contingent of Brutes, will go with him on the mission. 'Vadamee is not happy about the Brute involvement but is happy that he has received the promotion and may be on the way to becoming a Fleet Master. After 'Vadamee leaves, the Prophet states that the Hierarchs did not expect that the humans would be spread out on so many worlds. This may be the reason why the Covenant lingered so long around Harvest instead of trying to find other human worlds. After a slightly uneventful voyage to Hesiod, the Jiralhanae and the Kig-Yar Shipmistress betray 'Vadamee, destroying his ship, killing his crew, and taking him and his Zealots prisoner while he was unconscious. Aboard the Midsummer Night everyone was on edge as a Covenant vessel was on radar and they had to be careful of detection. They followed the Kestrel to Hesiod to discover that the rebels were using asteroids as a hideout. They drifted closer and discovered that they were all connected as well as Jackal ships navigating through the asteroids. The Midsummer Night was brought up to battle ready status and began to make stealth maneuvers to avoid any patrolling ships. Inside the Rubble, Thel 'Vadamee and his bridge crew had been captured by the Kig-Yar. Jora 'Konaree having thrown himself, unarmed, against the boarders had been wounded and asks Thel to kill him for his shame. After slamming a spike from a nearby bed into Jora's head, the remaining Zealots, led by 'Vadamee, decide to find out a way to strike at the Humans from inside the Rubble. Realizing that the Kig-Yar intended to gain a ransom for their captives, Thel and his warriors decide that while the Jiralhanae wanted the credit for finding the humans themselves, they decide to go after Bonifacio whom they believe is their leader. The Sangheili trick their Unggoy guard, kill him, the rest of the guards, and escape. On the Midsummer Night, Commander Zheng discovers that the leaders of the Rubble know of their presence. The Rubble begins a bombardment of the ship, and Zheng orders that they head out to open space. However, the engines are taken offline via sabotage, and on the bridge Lieutenant Badia Campbell shoots Zheng fatally, and wounds Lieutenants Kirtley and Li before Keyes tackles her. She says that the Insurrectionists will win eventually before shooting herself in the head. With the engines out of commission and Zheng dead after locking down the nuclear warheads (rendering them unusable to the rebels), Keyes has no choice but to surrender the ship to the Rubble. Keyes and his crew are taken aboard the Rubble and are permitted to join the population. Keyes gives a short speech urging them not to, and some stay with him, including Faison, Kirtley, and Li. Many others join the population. Keyes asks Faison why a number of ODSTs are joining, too, and Faison reminds him that ODSTs are first in everything, implying that they're going to be undercover in support of them. Meanwhile, upon Delgado's return to the Rubble, he is detained by Bonifacio's private forces. The Council suspects him for dealing with the Kig-Yar for the NAV data, since he was the only one apart from them who knew its location. While conversing with a guard, Delgado learns that Bonifacio's smuggling ship, the Kestrel, was sabotaged by the SPARTANs and its NAV data was destroyed; as a result, Bonifacio needs Delgado's data in order to continue his smuggling operations back to the Inner Colonies. Delgado is subsequently taken to meet with the Security Council, where he learns of the existence of the Exodus Project. While the Council refuses to tell Delgado what the Exodus Project is, Diego Esquival reassures Delgado that it is for the good of the Rubble and requires NAV data. This convinces Delgado to retrieve the data for the Council. Diego and Bonifacio decide to accompany him to retrieve the data from Delgado's ship, Distancia. However, on the ship Bonifacio betrays Diego and Delgado. He forces Delgado to hand over the NAV data so that he can give it to the Kig-Yar, and when Delgado resists he shoots Diego. Bonifacio then makes off with the data and sabotages the ship's airlock, so that Delgado cannot inform the Rubble of Bonifacio's treachery. As his ship runs out of air, Delgado sets off the SPARTANs' beacon. Thel and his Zealots, meanwhile, hijack a Kig-Yar ship and head down to the surface of Metisette, a methane-rich moon of Hesiod where the Kig-Yar are breeding an army of Unggoy. They are able to kidnap Reth, the leader of the Kig-Yar. However, Reth reveals to the Sangheili that he is also working on a mission assigned to him by the High Prophet of Truth, which greatly confuses one of Thel's most trusted soldiers and de facto second in command, Zhar. Reth subsequently escapes with the aid of some Unggoy which he converted. The SPARTANs arrive and save Delgado, but are too late to save Diego who dies of his wounds. They decide that with the NAV data, the Kig-Yar will no longer value the Rubble and will attack it. They need to briefly capture one of the Kig-Yar ships to find their plans. However, even three SPARTANs would not be able to capture a Covenant ship; they decide to liberate the captured ODSTs from Midsummer Night and use their help to secure the ship. With the help of the Rubble's AI, Juliana, the SPARTANs are able to liberate Keyes and many of his men from prison. Delgado joins the main UNSC forces as they assault the Kig-Yar ship Infinite Spoils in an attempt to find information on the Kig-Yar's true intentions. The humans have the element of surprise and manage to capture it; however, Faison is wounded in the leg during the battle. He insists that Delgado leave him, but secretly Delgado asks for help. Lieutenant Keyes sends Jai to rescue the ODST. Meanwhile, Thel and the surviving Sangheili also desire the Kig-Yar vessel and board it. They encounter Faison, who manages to injure Zhar with a sidearm before being killed. At this point Zhar treads on the edge of heresy by admiring the human's act of staying behind; however, they are interrupted by Jai's arrival. Jai and Thel fight each other, with neither gaining any ground; Jai leaves when he sees Faison's body. Thel himself barely survives the encounter and wonders what the human was. During this time, Adriana sneaks up onto Bonifacio in the Distancia and fires at it, disabling its engines and allowing her to board it. Bonifacio escapes in an escape pod, and forces Adriana to allow him to escape by withholding where he kept the NAV data taken from Delgado. Adriana subsequently finds the NAV data and returns to the Petya. With the information from the Kig-Yar vessel, the humans determine that the Kig-Yar are in fact planning a massive attack on the Rubble with the hundreds of thousands of Unggoy he has been allowing to breed unchecked on Metisette. Reth plans to capture the Rubble and use the NAV data to take the Exodus Project, which in fact is a giant asteroid habitat planned to transport the entire population of the Rubble away from both the UNSC and the Covenant, to Earth and capture it. This would earn the Kig-Yar much more favor in the eyes of the Prophets than the Sangheili. Lieutenant Keyes devises a plan to stop this; while they take the recaptured NAV data to the Exodus asteroid and begin evacuating the citizens of the Rubble, the humans would also bombard Metisette, the Kig-Yar moon base, with unneeded pieces of the Rubble. To do that, however, Julianna informs them that the Kig-Yar surface defenses must be destroyed. She outlines two main objectives: an anti-air battery and a sensor station. The destruction of these will allow her to drop pieces of the Rubble onto Metisette, effectively destroying the Kig-Yar base there. UNSC forces use a daring maneuver to drop ODSTs and the Spartans to the surface. Jai and Adriana aid the Marines with their objectives, laying charges on the AA battery and planting a remote nuke on the sensor station. The nuke, in addition to destroying the sensor station, also damages a large portion of the Kig-Yar base and wipes out much of their fleet. Without the sensor station or the AA battery, the Kig-Yar are powerless as Julianna systematically bombards their base with the Rubble. Reth is among the dead. Thel, aboard his ship stolen from the Kig-Yar, sees this and decides to send the last of the Unggoy aboard on an abortive attempt to capture the Exodus Project. The attack fails, and the Rubble's citizens successfully evacuate into the Exodus Project. It and the Midsummer Night jump to slipspace and set a course back to UNSC-held territory - the Rubble engineers realized that they would not have enough supplies to reach their original intended destination, and Lieutenant Keyes convinces them that for the good of the Rubble's citizens, they must return to the UNSC. Bonifacio witnesses the bombardment of Metisette, when suddenly a massive Covenant fleet jumps out of slipspace. He attempts to hail them, and is momentarily glad to watch them turn towards him, but is horrified when a cruiser effortlessly vaporizes his pod. Thel and Zhar meet with the Prophets of Truth and Regret, who has arrived in the system with a large fleet. It is revealed that Truth and Regret have been working separately, leading to the confusion between Reth, commissioned by Truth, and Thel, sent by Regret. Zhar believes that they will be executed, and activates his energy sword to attack the Prophets. Thel is horrified but draws his own sword and stabs Zhar through the neck. Regret is visibly shaken and leaves, but Truth tells Thel that he survives but will speak nothing of what he has learned to anyone. Truth then proceeds to grant Thel a ship in the Fleet of Particular Justice, hinting that he will eventually become its commander and much later the Arbiter of Halo 2 and 3. The Exodus asteroid and the Midsummer Night arrive safely at 18 Scorpii, and the asteroid's inhabitants are safely evacuated before the asteroid shakes itself to pieces while in orbit around Falaknuma. Back on Sanghelios, Lak 'Vadamee discusses with Thel about the reorganization of the fleets and what is to come of this "strange new age". Lieutenant Keyes returns and meets with Admiral Preston Cole, and expects to receive a court-martial for his actions but instead is congratulated and thanked by Admiral Cole then promotes Keyes to Commander. Commander Keyes leaves and the Spartans enter; during the battle the Petya was abandoned, and they are looking for a new prowler. Cole grants them the ship and gives them new orders, describing them as more dangerous than ever, to the satisfaction of Gray Team. Delgado enlists in the UNSC Navy. Soon after, Keyes returns to his apartment and his daughter, Miranda. The original version of the cover, with a scopeless BR55 Service Rifle and a second SPARTAN in the background. There is also a combat knife on the chest, while on the printed cover it is over the shoulder. The Cole Protocol is the only Halo novel, aside from Halo: Cryptum, that does not give the current military time at the start of every chapter. This makes it somewhat difficult to keep track of time when the setting shifts radically. This book is the only novel that does not feature an assault rifle from the MA5 series. The BR55 Battle Rifle is almost exclusively used by UNSC forces in the book. Amazon.co.uk released Halo: The Cole Protocol several days earlier than the official release date. Before the space battle of Charybdis IX, it is stated that Cole's fleet is still near Harvest, but at the end of the book, he is back inside the Inner Colonies. Due to the absence of dates at the start of chapters, it is difficult to confirm whether a great deal of time has passed, or this is just an oversight by the author. On page 281, Zhar uses the term "years" rather than "units" or "cycles", though this is likely a transliteration of Sangheili speech. UNSC personnel use American measurements throughout the book, while the UNSC typically uses the metric system. The novel is the first canon source to call a plasma grenade a "sticky grenade", which is a common nickname for the weapon in multiplayer. In Halo: The Flood, according to one of his memories while being consumed by the Flood, Keyes first killed a human with a pistol. This was retconned in Halo: The Cole Protocol, as it is revealed that he first killed a human with a modified plasma rifle. Throughout the book, rather than saying "ooh-rah", Marines use the interjection "hoo-ah", which is an equivalent term used by the Army. Marines in all other Halo media use the term "ooh-rah". The MJOLNIR Mark IV armor depicted on the cover strongly resembles the MJOLNIR Mark V "redux" seen in The Art of Halo 3, as both were created by the same artist, Isaac Hannaford. The differences in design between the MJOLNIR Mark IV suit on the cover of Halo: The Cole Protocol and the version seen in Halo Wars, Halo Legends, Halo: Fall of Reach - Covenant, and the cover of the re-release of The Fall of Reach have led to bitter controversy among fans, as the version featured in The Cole Protocol was created by Bungie, rather than by a third party. It has since been confirmed that both models are canon. This book, along with Halo: Contact Harvest and Halo: Ghosts of Onyx, is in the Halo Boxed Set. Clean version of the cover art.